From the beginning, we are using Locus Pro with the MTB Europe map, wich includes bicycle maps !! We use it only as a track recorder and for tracks planning. And sometimes for dashboard. It’s far away much better than the expensive Garmin Edge Touring device we tried !! Thanks a lot for this application. We think about small improvements for our everyday use, but I will open a specific topic for that ! We will now go through Russia from Vyborg (West) to the Sakhaline Island (East), and then Japan from north to south. Not sure the maps are as accurate as the one for Europe… We’re not even sure the track planning will work properly. If you have some tips, we take any advice !!!! The Karoutcho team, it’s Emilie & Romain, mid-thirties, and their two bicycles. Not really cyclists, not really campers, without any sense of direction, and with a dramatically different logic… On these solid foundations, we decided in april 2014 to prepare our first bike trip with our home packed in small bags: a 45 000 km journey around Europe and Asia! From scratch, we prepared everything in ten months before we mounted our mechanic horses. Why biking? Cause it’s faster than hiking! But above all, it seems to be the best way to meet people. But still, it is just a way of traveling: the human experience is the heart of the project, much more than the sporting achievement that could lead us to ride many kilometers losing the sight of what’s really important. The first push on the pedal was in Nantes (France) the 22/02/2015. A two years journey that will lead us through the Norwegians fjords, make us cross Russia, ride down Japan and around South-asia, down to Myanmar. Then we’ll have to think about the way back… But it’s not for tomorrow!! During the preparation, we had to choose a good GPS system with good offline capabilities. We tried expensive GPS devices, and many GPS apps… We finally started the travel with Locus Map Pro. It does everything we need, is very reliable and mostly: easy to use! It’s a everyday use, mainly for its offline map capacity, but as a GPS tracker, route planner as well. Almost every setting can be personalized. Now, it’s been more than 6000km, and Locus is a part of the Karoutcho crew !! I was really more than happy with Locus for now. Then, you made me discover the “Vector maps”. Before, I spent big time in downloading the maps almost everyday, that followed the tracks we planned to go. And deleting the maps that were not used anymore to save some megabytes. The map of the entire country is already downloaded, for fewer disk space. And… much more precise !! How come I didn’t know about that before ! have loads of point of interest already included with the maps !!! It changes our everyday travel life, really. Thanks for the app, and for those incredible vector maps. That really brought smiles on our faces, thanks too! We know that Locus Map with our vector maps can be a reliable partner on such a tremendous travel. 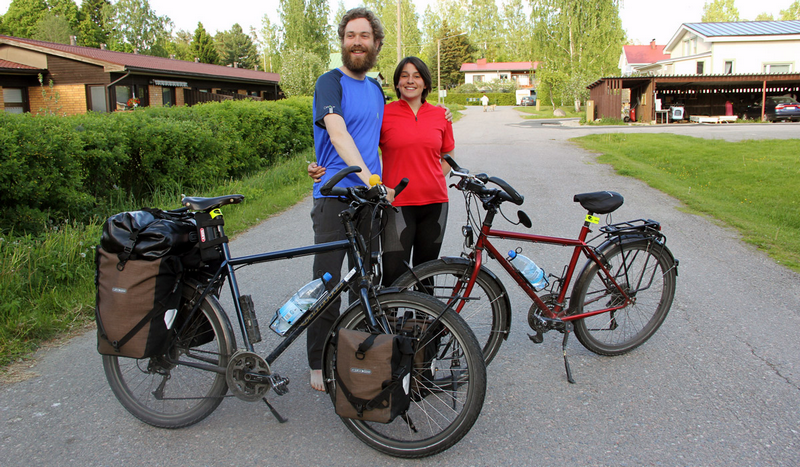 Since then, Emilie and Romain have made it to Khabarovsk so far – across almost whole Russia! Partly on their bikes, partly on trains, as can be seen on their website Karoutcho.fr. We admire their courage and commitment and wish them good luck!